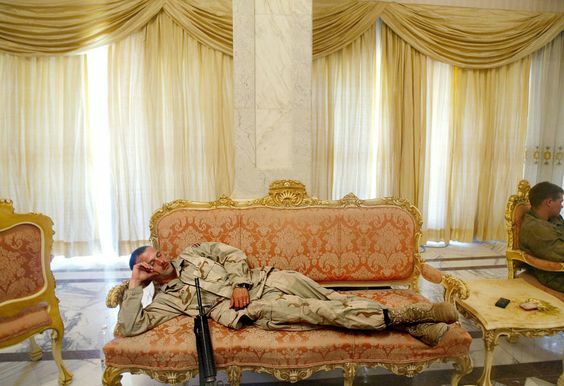 US marines lolling and napping in Saddam's palace. All these guys have seen throughout their lives are those dingy little one or two rooms apartments. Their heads must have started to spin seeing this. And when they fly back home, it will be a return to their old squalid dwellings. No wonder they're making hay while the sun shines. And the following one is the most shocking of all. 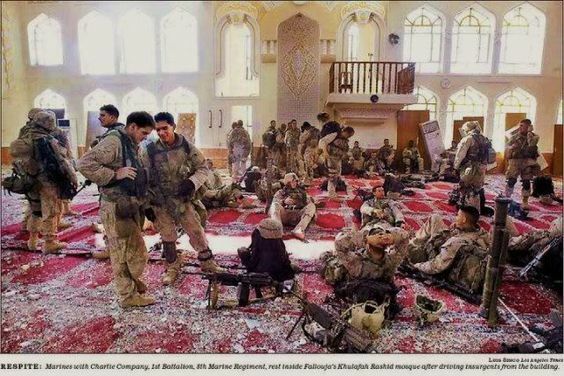 Filthy marines desecrating a beautiful Mosque in Fallujah, lounging on the carpets with dirty shoes. These people aren't humans, forget about civilization. 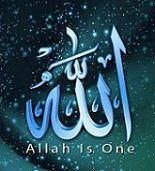 True brother. Though this is the 21st century, occupation still means exactly the same as it did in the ancient dark ages. Buggers like the marines are the "modern" times' marauding stoneage barbarians.